Armchair travelers and dedicated students alike can benefit from Parlo Inc.’s online language instruction. Parlo’s course materials range from beginning to advanced courses in five languages: English, Spanish, French, Italian, and German. With more than 500,000 users in 100 countries, Parlo is a leader in online language learning. The services are even in use in Antarctica, where Raytheon Systems Co. employees at the South Polar station are studying foreign languages via satellite during the long polar winter. Parlo has won numerous awards, including a Best Language Learning Site award from Yahoo and a position on Condé Nast’s Top 50 Travel Sites list. Parlo lessons focus on real-world language use, basing each lesson on an everyday topic such as buying a plane ticket or using e-mail. The thematic lessons rely on authentic language and the sorts of conversations everyday fluent speakers might have, rather than the stilted phrases found in many language guides for travelers. 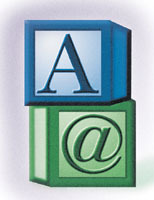 German e-mail lessons are available now; online lessons will be launched soon. Parlo offers three types of instruction. Users can sign up for free e-mail lessons, which arrive daily in subscribers’ inboxes. There are also online e-lessons and complete courses, accessible through the Parlo Web site (www.parlo.com). These range from lessons for travelers to advanced courses for those working toward fluency. Students take a diagnostic placement test that determines where they should begin their coursework. According to Parlo executives, educators at all levels, from kindergarten through college, use the service. Until now, Parlo has not actively marketed the service for course adoption; instructors have found and adopted Parlo themselves, making it part of a “blended” teaching solution that combines classroom instruction with the online material. In 2002, however, Parlo will take the service to a new level, partnering with a major publisher to package the e-lessons with Spanish language textbooks. The supplementary e-lessons will emphasize authentic language, cultural information, and current events relevant to the Spanish-speaking world.